I’d always wanted to publish a hardback, but never really got around to it with my own books and most clients choose paperbacks, mainly due to cost considerations. That was until I was approached by a lady called Rosey Messing, who had written a family history with a difference. Most family history books are written from the third person, keeping strictly to the facts as known. Rosey had wanted to do something different with her family story after finding a letter written by an ancestor who had travelled from Ireland to Canada in the 19th Century. The letter from her ancestor inspired Rosey so much that she decided to travel the world meeting and talking to relatives. Before long she found herself obsessed with her research and knew she was uncovering a fascinating story. 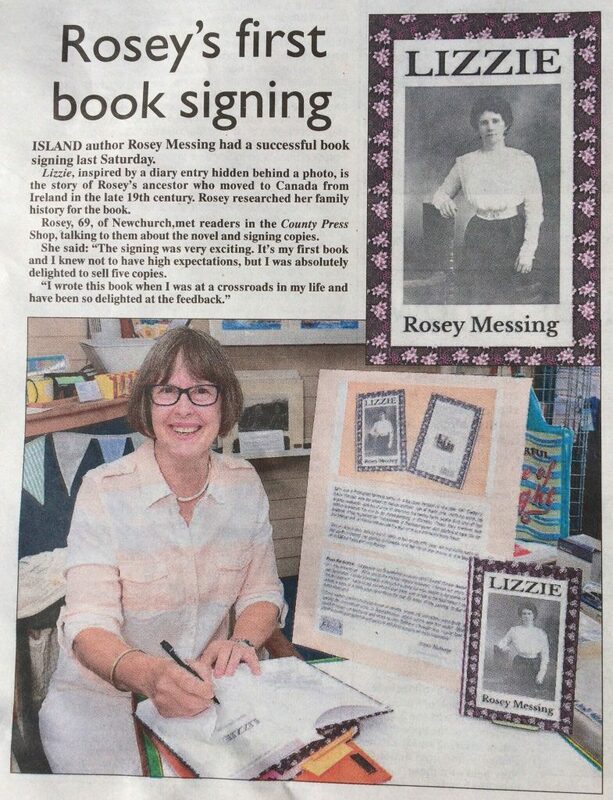 Press cutting of Rosey Messing, author of Lizzie, at her book signing at County Press Shop in Newport, Isle of Wight. 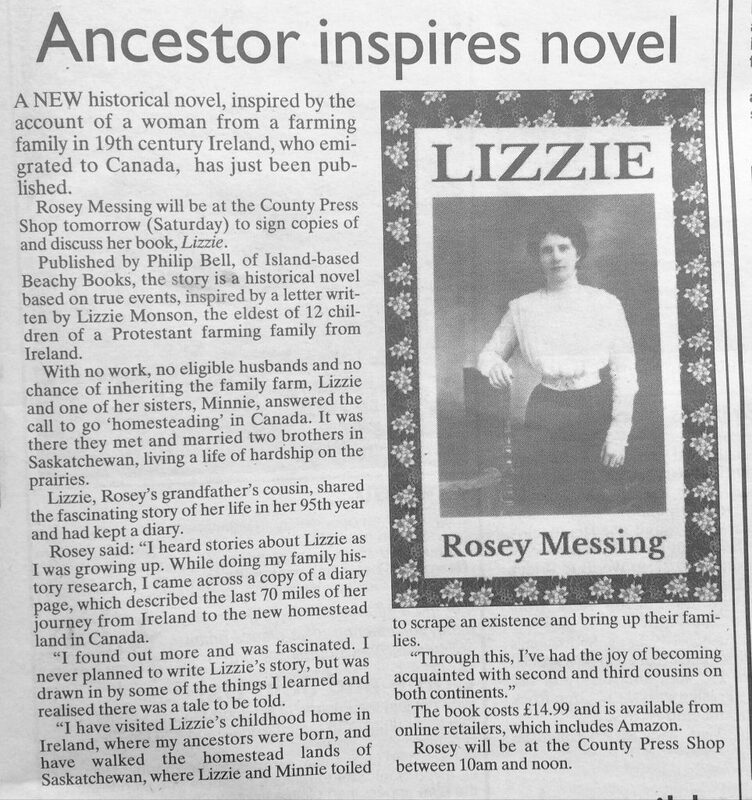 Press cutting from County Press about Lizzie. 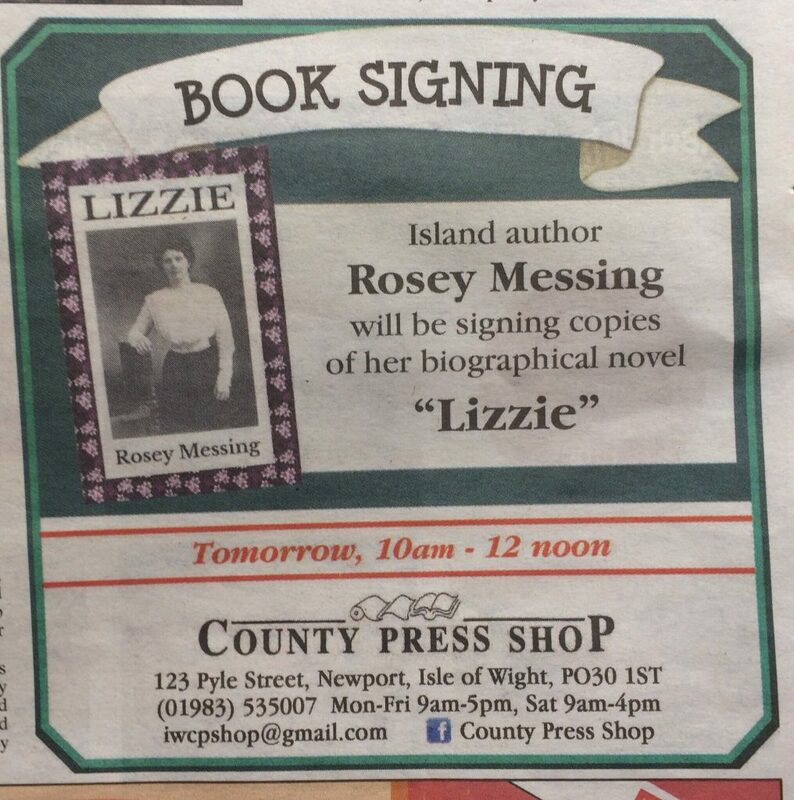 Advert for Rosey’s book signing at County Press. Lovely to see great support and coverage for local authors in Isle of Wight County Press. When it came to writing the facts Rosey just couldn’t get the ‘voice’ of the girl out of her head and she soon found herself channeling her epistolary style as she wrote the story. Before long she found that pages of prose and dialogue and fiction had suddenly poured out into her word processor. She was mindful of keeping as best as she could to the basic facts of the story, as told by her ancestors and from factual accounts and records, but she isn’t ashamed to say some of her story is a figment of her imagination. When Rosey had finished and read it many of her extended family all over the world were itching to read it and thought she should publish it. She came to me and we worked on a plan to publish the book as an exclusive hardback with a nice modern design twist on the usual family-history cover. When I read the story I enjoyed it and thought it would appeal to fans of historical novels so thought it would have wider appeal than just direct family or people interested in local history. And the rest is history because it is now published and for sale and has actually been our best-selling book this year due to a large order from an American wholesaler. I was over the moon when I saw the royalty statement, which means a nice little earner for Rosey and Beachy Books. 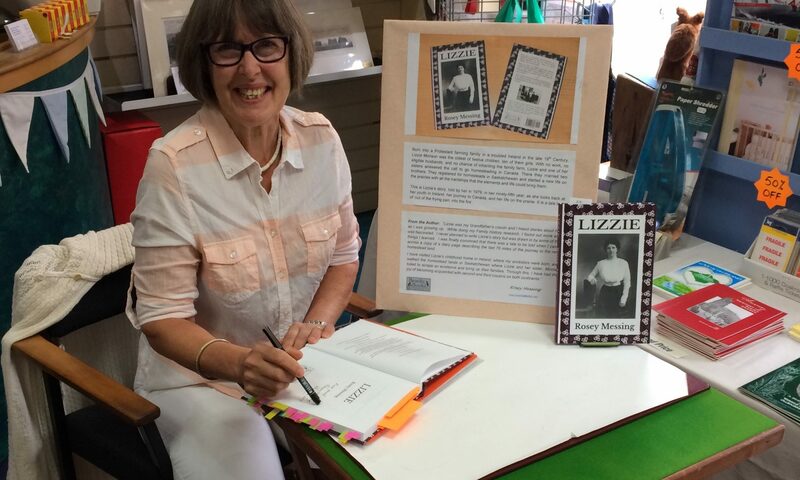 If you fancy a historical read about a woman who makes an incredible journey to start a new life on the Canadian prairies then take a look at Lizzie by Rosey Messing on our website.